Here is a great, fast and easy dinner. Sometimes cooking is a chore. You arrive home from the gym or from work and you are faced with the daunting task of looking through every cupboard for what to make for dinner. Although, most of you should be prepared beforehand, the times that you are not, give this recipe a shot. This pasta is healthy, low-calorie and very delicious!! Add asparagus and sautee’ asparagus for 3 minutes. Add shrimp, red pepper, oregano and basil. Cover and cook for 5 minutes or until shrimp are pink and vegetables are tender-crisp; stirring occasionally. Drain pasta. Add shrimp & vegetables. 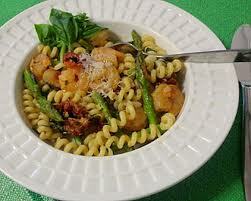 Toss with 1/4 tsp red pepper and parmesan cheese. Serve & enjoy!